There's nothing wrong with cooking variations on the dishes we know and love. This salad couldn't be easier. Roast a few ingredients together, then toss them with some leaves and a dressing. That's it. 1. Heat your oven to 210ºC. 2. 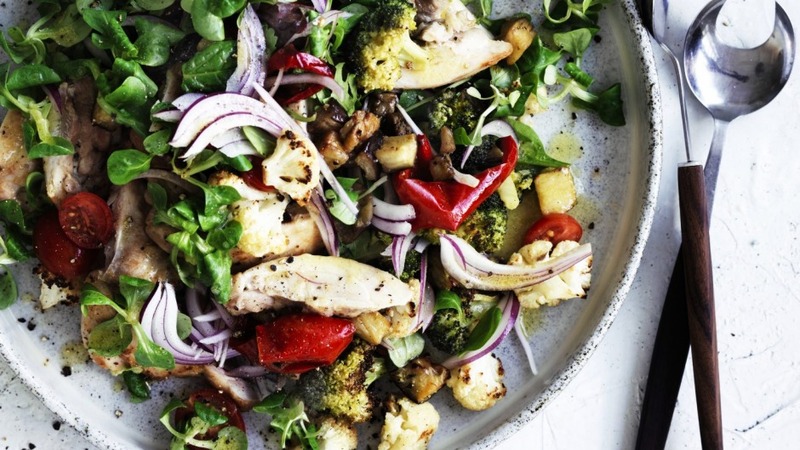 Combine the chicken, broccoli, cauliflower, capsicum, eggplant, cherry tomatoes and anchovies in a bowl, add the oil and stir to coat. 3. Transfer the chicken and vegetables to a lined baking sheet large enough to fit everything in a single layer with a bit of space between the vegetables. You can use two baking sheets if you prefer. Season well with salt. Roast the chicken and vegetables for 20-25 minutes, until the chicken is cooked through and the vegetables are starting to char around the edges. 4. Whisk together the ingredients for the vinaigrette. 5. Thickly slice the chicken thighs and toss everything together - the chicken, roast vegetables, raw onion, salad leaves and vinaigrette - so that the salad leaves slightly wilt under the hot vegetables. 6. Grind over plenty of black pepper and serve. * Even if you don't like anchovies, it's worth including them in this salad. They're finely chopped and will disappear during the roasting process, but will leave a rich flavour on the chicken and vegetables. If you must avoid them, add some porcini powder to the vegetable mix, or even gravy powder to increase the umami.